The New York Naval Militia's heritage is over one hundred years old. In the 1880s, a U.S. Navy proposal to organize a national Naval Reserve Force went before Congress. Although the bill was defeated, the organizational plans, prepared by the Navy, formed the basis for numerous Naval Militias which sprang up throughout the States during the following few years. The New York Naval Militia was organized as a Provisional Naval Battalion in 1889 and was formally mustered into State service as the First Battalion, Naval Reserve Artillery, on 23 June 1891. One year later the New York Naval Militia was called to active duty to protect steam ship passengers during the 1892 cholera quarantine at Fire Island. Following the sinking of the USS Maine, the Navy Department called up Naval Militia volunteers for duty in the Federal Auxiliary Naval Force; The Spanish American War had begun and the New York Naval Militia was in the thick of it. 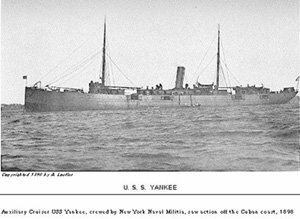 New York Naval Militiamen manned two auxiliary cruisers that were engaged in the Battle of Santiago and served aboard various other ships including patrol craft tasked with protecting New York Harbor. During the early 1900's frequent attempts by Congress to create a National Naval Reserve Failed. In 1914 however, Congress passed the Naval Militia Act which placed the State organizations under the supervision of the Navy Department. 1916 saw the establishment of the United States Naval Reserve Force. Unfortunately, only those persons with prior Naval service could affiliate. This left the Naval Militias as the only avenue for landlubbers to become sailors. The National Defense Act of 1916 resulted in the creation of the National Naval Volunteers, which the New York Naval Militia joined en-masse. 1916 also saw the formation of a Naval Militia Marine Company. The Militia Marine Company was the first in the Nation and predated the United States Marine Corps Reserve program by four months. In addition, the donation of a hydroplane, by patriotic citizens, marked the beginning of the Naval Reserve Aviation Program. During the next 34 years, the New York Naval Militia (Naval volunteers/Navy and Marine Corps Reserves) were Federally mobilized for both World Wars (100%) and the Korean conflict (75%). It was during the Korean conflict that many of the State Militias began to disappear. The New York Naval Militia recognized the parallel to the Reserve structure and the New York Military Law was changed, making it compulsory for all New York Naval Militia members to be drilling Navy or Marine Corps Reservists. In 1996, Memoranda of Understanding were signed between the New York Naval Militia and the U.S. Navy and the U.S. Marine Corps, recognizing and reconfirming their respective commitment to further each other's programs and to closely coordinate activities. In 1997, a memorandum of Understanding was signed between the New York Naval Militia and the U.S. Coast Guard, permitting Coast Guard Reservists to volunteer to join the New York Naval Militia. In 1998, New York State Law was amended to permit Coast Guard Reservists to serve in the New York State Military Forces and the Law was also modified to permit up to 5% of the Naval Militia to be qualified volunteers. Today, the New York Naval Militia is the only federally recognized Naval Militia with continuous, unbroken service dating back to the 1890s. Its members are proud of the Naval Militia's long history and tradition of voluntarism and service to the Nation and to the State of New York, and have dedicated themselves to carrying this tradition into the future. USS AILEEN: Commissioned as USS Aileen in mid-May, she served in a coastal defense role during the Spanish-American War. In May 1899 Aileen was assigned to the New York Naval Militia, with which she served as a training ship for over a decade. 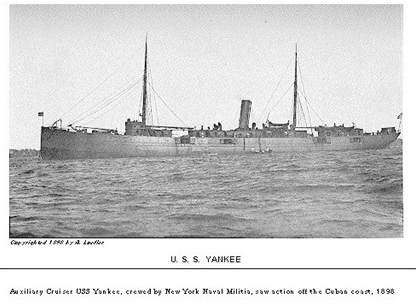 Her New York service ended in November 1909, and in 1910 she joined the Rhode Island Naval Militia. USS WASP (7th): After the Spanish-American War, the seventh USS WASP served along the U.S. east and gulf coasts, as a training vessel and station ship. IN 1908, she was assigned to the New York Naval Militia, where she served for nine years as a training vessel. USS SANDOVAL: Loaned to the New York Naval Militia on 16 November 1906, she arrived in Lake Ontario in September 1907. Commissioning each summer for training duty on the Great Lakes, she was based at Charlotte Harbor, New York, and frequently cruised to Ogdensburg and Sackets Harbor, New York. During World War I, Sandoval continued her training duties on the Great Lakes, calling at ports such as Erie, Pennsylvania, and Chicago, Illinois., into 1918.